We went up to DIA: Beacon on a recent grey and sleety day, taking the five year old along for some culture. 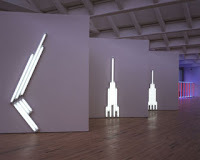 The space is huge, enormous, expansive - and there was hardly anyone there. It felt like a gift, seeing the art and the building through the eyes of the unrestrained child. She danced around the Bourgeois spider, navigated past Sandback's delicate strands of yarn, and peered into all of Heizer's holes and Judd's plywood boxes. "I want to go in the sculpture." 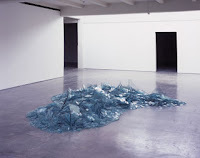 "It's a pile of broken glass?" "It's NYC! It's like your office, Mommy!" Afterwards, we had lunch in the small cafe. I ordered a turkey wrap for her, and asked them to hold everything but the tortilla and the turkey. To my great happiness, we were only charged $1.50 for it; I was fully expecting to have to pay for the whole sandwich and all its adult accoutrements. Later, in the car, she asked me for the second half of it: "Can I have my ham taco now?" True story: One of my first dates with the husband was at the DIA (the Manhattan one). 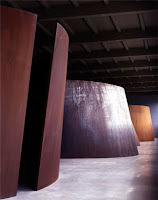 Seeing Richard Serra always makes me think of that now! The second I got there, it started pouring and a lightning storm started. Everyone who was spending more than 20 minutes there fled to cars and bathrooms leaving me to experience the Grand Canyon literally by myself. It was so worth changing my clothes in my car in the parking lot. Thanks for the vote in the Shorty Awards! Much appreciation for your support. Anyone who's thisclose with mah girl Jules has got to be awesome herself. Ada thinks meat is "ham" too. Somehow I'm guessing that DIA is NOT our DIA (Detroit Institute of Arts). "Ham Taco" ... That's how entire blog names are born. I have a post on deck about art institutes and such. It's been burning a hole in my deck for a while now. Maybe I'll just post it now...but then again, I have a pretty big deck. Very cool outing for your youngun'.